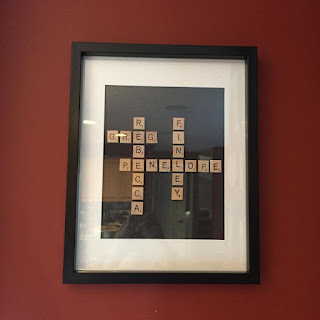 This year Greg, my sister and I decided to homemade gifts to each other. I was both very excited and overwhelmed by this but more on that in a later post. She made these gifts for Greg and I and they turned out really good. This was mine. I really like it but I knew I was getting it because she was asking me about Scrabble letters and then I saw her pin some scrabble themed ideas on Pinterest. But even though I knew, I still really liked it. I have framed scrabble letters downstairs in the basement above the couch that say HOME. So it fits well although this is hung in my kitchen and not downstairs hahaha. These are the snowmen that Kristy and her boyfriend made for Greg. The hat on one fell off and Greg actually had to glue it on while it was still in the bag before christmas because he couldn't see it. These work well in our main floor because we have a very rustic look going on. 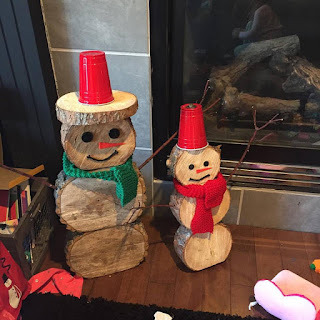 The only problem I foresee with the snowmen is storing them and not destroying the arm branches. It should prove to be interesting once I start putting the decor away for another year.